Brilliant, wonderful, and simply "Fantastic"! 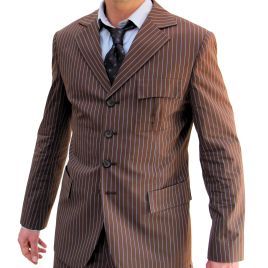 Although I was heart broken to not be able to get this suit in the 10th Doctor's original brown, I was lucky enough to get it in Blue with the red Pinstripe. and I have to say it fits like a glove. As a suit, and not just a replica of a TV character costume, it is simply a beautiful look. I'm keeping my eye out for the original Tennant colors, but seriously thinking about getting more in various colors as the cut of this suit really... well, suits me. Indy did a great job of making this fit me perfectly based on the measurement I was able to get him, so have no fear you can't go wrong ordering from here! It's a guarantee that this will not be my last order. I also got the Rear-Vent Cashmere Coat so check out my review there as well.